This Life is a Beach card was made on my Cricut and given to my parents as a thank you, for allowing us to stay in their beach house. It is a very simple design, but it shows some of the cute ocean designs that come with the Life is a Beach cartridge. The card is 7" wide. For something a bit different, you can use a small piece of sandpaper as the background of the window to resemble the beach. You can make your own sandpaper too with a bit of spray glue and some sand. One 7" x 5" sheet of cardstock in a tan color for the inner background to resemble sand. You could also use sand paper, or glue sand to some regular paper. 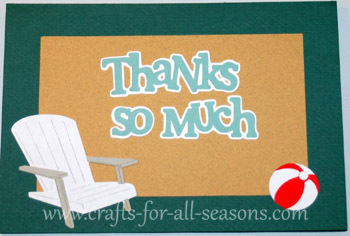 Beach chair photo card cut at 7"
Beach chair cut at 2.5"
Beach ball cut at 1"
"Thanks So Much" cut at 1 3/4"
1. To make the Life is a Beach card, load the 8.5" x 11" teal or blue cardstock. Select the beach chair (button 50). Select "photo card" (button option of the left). Select size 7". Hit "Cut". You will also get an extra beach chair cut out in the center; you can save this for another use. 2. Cut a piece of sand colored paper with a paper trimmer, to create a slightly smaller rectangle than the outside border of the card. This can be glued to the inside of the card, in the upper part. This creates a background for the front of the card. 3. Load a scrap of white paper. Select the beach chair (button 50). Select size 2.5". Hit "cut". Do not unload paper. Next, select the beach ball by hitting "shift", then the "beach chair" button again (button 50). Select size 1". 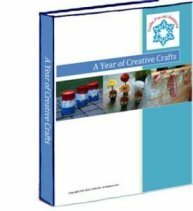 Glue the beach chair on top of the chair that was cut when you made the border of the card. Glue the white beach ball in the other corner of the card, as shown. 4. For the beach chair layers, load a scrap of gray paper. Select the beach chair (button 50); then "layers". Select size 2.5". Press "cut". 5. For the beach ball layers, load a scrap of red paper. Press "shift" then the beach chair button (button 50); then select the "layers" button. Select size 1". Press "cut". Glue these on top of the beach ball. 6. The "Thanks So Much" was cut using the Stamping Solutions Cartridge. Select "thanks so much" (button 29) and select size 1 3/4". Hit "cut". The for the shadow, load a contrasting shade of paper. Select the "shadow button", then "thanks so much" button once again. Keep this at size 1 3/4" as before. Select "cut". Glue the shadow first to the tan cardstock, then the smaller font on top of it.